While your home greenhouse may not be as imposing a structure as the Palace of Versailles greenhouse in France, measuring 500 feet long, 42 feet wide and 700 feet high, you can still use a smaller greenhouse to grow plants, decorate your yard and provide shelter for yourself and other creatures. 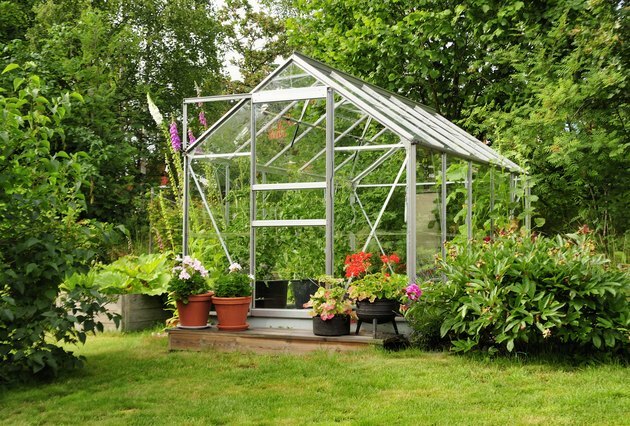 All greenhouses have similar uses, whether they're shaped like domes, A-frames or Quonset huts, constructed with plastic sheeting or glass and framed with plastic pipes, wood or metal. Landscape around your greenhouse with flower pots and plants. Greenhouses have protected tender plants throughout history. The ancient Roman Emperor Tiberius used his portable greenhouse on wheels to grow the cucumbers (Coccinia grandis) that he ate daily and which can only grow outdoors in U.S. Department of Agriculture plant hardiness zones 10 through 12. Northern Europeans in the 1600s grew oranges (Citrus sinensis) in their greenhouses, or orangeries, because oranges only grow outdoors in USDA zones 9 through 11. And George Washington grew pineapples (Ananas comosus) in his greenhouse since he lived outside the boundaries of USDA zones 10 through 12. All greenhouses buffer plants from freezing temperatures and have clear walls and ceilings, allowing plants ideal growing conditions with maximum sunlight. Some greenhouses have built in heating systems to protect plants during the winter, while others rely on the buildings themselves to keep temperatures inside the greenhouse above freezing. In areas with very hot summers, greenhouses might also work as shade houses, with drapes or screening to block sunlight during peak hours for plants that can't tolerate hours of direct sun. If you live where winter temperatures are well below freezing, a greenhouse allows you to grow plants year-round. You can bring in pots of vegetables from outdoors so you can harvest crops longer, and you can plant cool-weather fall and winter crops inside the greenhouse, such as chicory lettuce (Cichorium intybus), which grows outdoors in USDA zones 4 through 7, or broccoli (Brassica oleracea var. botrytis), which grows outdoors in USDA zones 8B through 9. Vegetable gardeners use their greenhouses to give some crops an early start before setting them in the ground, first growing seedings indoors under grow lights, moving the plants to the greenhouse for a few months, and then transferring them outdoors when all danger of frost has passed. Warm-weather crops that need this treatment include tomatoes (Lycopersicon esculentum), which grow outdoors year-round in USDA zones 10 through 11, and eggplant (Solanum melongena) which grows in USDA zones 9 through 12. Most gardeners enjoy puttering in their greenhouses, perhaps surrounded with tropical plants, while the weather is cold outdoors -- gardeners with large greenhouses bring animals inside too. Harvey Ussery, a writer for Mother Earth News, brings his chickens into a pen in his greenhouse each night during the winter, warming the greenhouse and keeping his flock warm. He also built a 3-by-4-foot worm bin in his greenhouse with a removable cover so the bin doubles as a workspace. What Can I Grow in a Greenhouse in Winter?